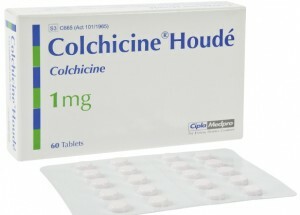 Colchicine, which is sometimes known as its brand name, Colcrys, is a drug that reduces swelling pain by affecting the way the body responds to uric acid crystals. As of 2009, Colcrys is the only brand of colchicine that has been approved by the FDA in the United States. Problems with colchicine center on the fact that its poisoning has been compared to arsenic poisoning. No specific antidote is available, although similar treatments have shown to work in the recovery from colchicine poisoning. Colchicine’s present medicinal use is for the treatment of a variety of impairments and diseases, including gout, pericarditis, Behcet’s disease, and familial Mediterranean fever. It is also being used experimentally in cancer treatments, since cancer cells have an increased of mitosis. This means that cancer cells are generally more vulnerable to poisoning by colchicine than normal cells. However, the therapeutic value of this drug in the treatment of cancer is limited by its toxicity against the normal cells.